Just read Neil Gaiman’s Coraline (2002), which I often hear hailed as his best novel. I don’t know — I think the premise is good, while the execution leaves something to be desired. This is especially apparent when compared with Henry Selick’s excellent film version from earlier this year, which improves quite considerably upon the story. 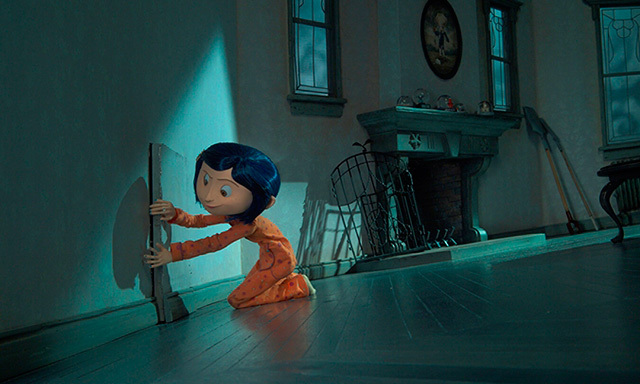 In the novel, the threat from behind the secret door in the house is almost immediately made apparent, while the film allows itself more time to portray Coraline’s attraction to the alternate life offered her on the other side. Gaiman hardly seems to have time in his plot for suggesting the dangerous allure of wish-fulfillment that drives it. The film, on the other hand provides this wondrous sensory experience to go with the narrative of the protagonist’s emotional maturation. The addition of the weird kid, Wybee, is also interesting. On one level, he functions–by being fun–as the kind of foil more common in film, which can’t in the same way rely on narration to carry the story of a lone protagonist, but he also nuances the story’s somewhat ominous hints at gender roles in the adult world by providing Coraline herself an opportunity to mirror her two mothers. This is all clearly to Selick’s credit — as I understand it, Gaiman didn’t have much to do with the adaptation of the book to film script — but I can’t help but feel that the novel displays one of the problems of Gaiman’s prose. Although he is clearly fantastically successful as a novelist, I for one have found that most of his books lack the power of visualisation so important to most fantasy literature. The ideas are often good, but there is something barebones about the presentation. We get the idea, and he even employs the visual analogue of a photo — later it degenerates further into a ‘small child’s scrawl’ — but there is something spartan about the evocation, almost encouraging us to think of it as a movie sequence, or a comics sequence of heterogenous panels, first painted/photoshopped, then drawn, by Dave McKean. It lacks the power of poetic suggestion, attempting to function on the premises of the visual narratives in which Gaiman has spent so much of his career working, and inevitably coming up short. I don’t know what to think about this. My initial wish was to see more comics from Gaiman’s pen, but the mediocrity of Marvel 1602, Eternals and “Whatever Happened to the Caped Crusader?”, are cautions to that particular case of wish-fulfillment. Perhaps his budding career in movie direction and production will eventually prove fecund, but that’s always a crapshoot when Hollywood’s involved. Whatever happens, I guess this serves to prove how dependent of visual representation Gaiman is. And while he hasn’t always been served particularly well by his collaborators — large parts of Sandman are seriously marred by lacklustre art — it stands to reason that his best work remains in comics. Is “Coraline” better than “American Gods”? I have no intention of reading “Coraline” but I assumed that the latter book was the more famous if only because of its Hugo award. Perhaps “Coraline” suffers because it is aimed at children? Coraline is simpler and more elegant and works with a time tested premise (through the looking glass as metaphor for maturation), which it updates to a contemporary setting. I don’t think it suffers in quality because it’s aimed for children — to the contrary — but it may have meant less exposure. American Gods is in some ways more ambitious, but it also seems to me directionless, as if Gaiman was working on the strength of a clever idea, but never quite figured out where to take it, resulting in a rather weak last third. Thanks, Matthias. It is interesting that you suggest that Gaiman’s comics are his best works across all mediums (I presume this includes things like Mr. Punch, Signal to Noise and Violent Cases). If this is the case, it would seem like a bit of a downward spiral for Gaiman over the last few years. I’ve certainly been less impressed with his novels than with his 80s and 90s comics work, which I still consider very good, but the vast majority of the greatly expanded audience he has reached by switching to pure prose would probably disagree. On the other hand, I find his books enjoyable enough to keep reading them, so I don’t find them all bad. To me, the only novel of his that works well is Neverwhere and that, incidentally, was first written with visual representation — a tv series — in mind. Good Omens I guess was fun, but really seemed more a Terry Pratchett novel, Stardust is kind of boring, and Anansi Boys wrings a disappointingly shallow story from a great basic metaphor of identity.